Dr.Jaswant Singh Puri,Recipient of Doctor of Letters(Honoris Causa) presented a copy of the book authored by him,titled,’’RISE AND DECLINE OF THE MUGHAL EMPIRE’’ to Her Excellency Baby Rani Maurya,Governor of Uttarakhand in a special function organised at Uttarakhand Raj Bhavan,Dehradun in the forenoon of Friday,Seventh September,2018. The foreword of the book was penned and the first copy of the book in the Indian state of Punjab was launched by Her Highness Maharani Preneet Kaur of Erstwhile Princely State of Patiala,Former Union Minister of State for External Affairs,Government of India,New Delhi,Ex-Member of Parliament(Lok Sabha) from Patiala and wife of Captain Amarinder Singh,Chief Minister of Punjab. The book is published by an internationally acclaimed,The Writer’s Publication House,Ahmedabad,Gujarat,India. The first copy of an aforementioned book in the Indian State of Tamil Nadu was launched by Hon’ble Dr.R.Velu,I.A.S(Retd),Former Union Minister of State,Railways,Government of India,New Delhi. The copy of the above mentioned book was also presented to His Excellency,The Governor of Punjab and Administrator of Union Territory of Chandigarh,Shri V.P.Singh.Badnore at Punjab Raj Bhavan,Chandigarh. Hon’ble Vice President of India had acknowledged with thanks a copy of the book titled ,’’Rise and Decline of the Mughal Empire’’. 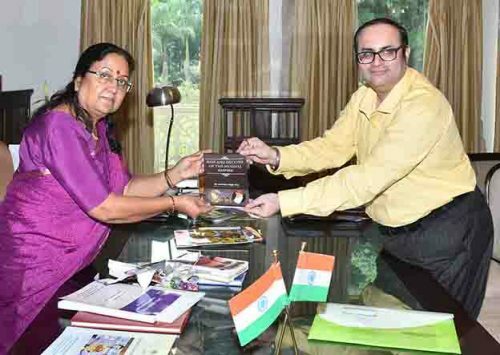 The copy of the book titled,’’Rise and Decline of the Mughal Empire’’ was presented to Shri Vijay Chopra,Recipient of Padma Shri,Chief Executive Officer and Editor-In-Chief of the Punjab Kesari Print News organisation at Jullundhur,Punjab. Dr.Jaswant Singh Puri is a Dewan Family Member of Erstwhile Princely State of Patiala,Punjab,India.